Air Niugini’s paradise lounge at the newly built Kagamuga International airport in Mount Hagen won the best “ Commercial interior design award” in the 2016 AkzoNobel Taubman’s Design Excellence Award held in Port Moresby last week. It’s a bi-annual event organized by the PNG Institute of Architects to recognize work of architects in the country and award them accordingly to the 8 categories. The paradise lounge project was submitted by Tropical Projects Limited, a National architectural company responsible for building designs and project management. It was among three finalists in the best “ Commercial interior design” category. The other finalists were Merea Haus’ Pineapple Building and TSL shop front at Monian Haus. Tropical Projects Limited’s Managing Director, David Gole in receiving the award said this is not the first time they have worked with Air Niugini on the lounge project and acknowledge the airline for the confidence and trust in them to complete the lounge in Mt Hagen. Mr Gole said when the building space was initially handed over to them last year , it had no finishes, ceiling, air-condition or fit out, however within months they were able to deliver to Air Niugini as expected, a high quality and comfortable lounge. “On the wall are a number of historic photographs and some modern high quality landscape and cultural portraits. All photos are distinctly Western Highlands with interesting paint colors add to the overall feeling.” Mr Gole said. Air Niugini Chief Executive Officer, Mr Simon Foo congratulated Tropical Projects for a job well done, adding that the airline looks forward to continuing the partnership with them in the future. 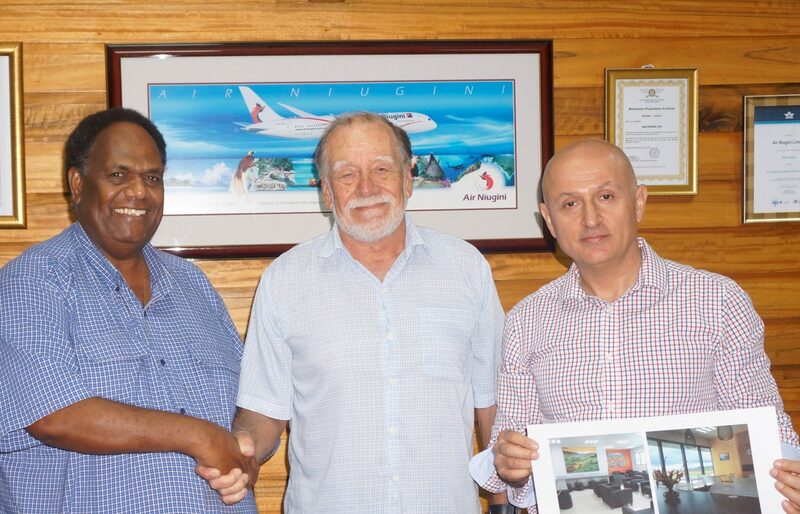 Mr Foo added that Mt Hagen is very important to Air Niugini and that the airline looks forward to working with relevant agencies to introduce a 24 hour operation for its B737 aircraft. Air Niugini’s paradise lounge at Kagamuga airport overlooks the air-strip so aircraft arrivals and departures are easily seen. The Hagen range is viewed in the distance and the ever changing Waghi Valley sky provides constant movement and color externally, ensuring passengers comfort and serenity. Tropical Projects Limited is currently providing contract administration work for Air Niugini, having competed the design and documentation for the upgrading of Air Niugini Nadzab terminal facilities. They are also looking forward to making another entry award in the next Design Excellence Awards to be held in 2018.